Middleton senior forward Tyree Eady and senior point guard Storm Murphy were both voted first-team all-Big Eight Conference during a meeting of the league’s coaches Monday night. 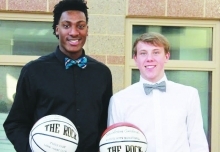 It marked the second straight year that Eady and Murphy were named first-team all-conference. The Cardinals’ dynamic duo were joined on the first team by Madison Memorial senior center Chris Knight, Madison East junior forward Keshawn Justice, Madison West senior guard Terrell Carey and Sun Prairie junior guard Marlon Ruffin. Knight was named the conference’s Player of the Year and Sun Prairie’s Jeff Boos was named the league’s Coach of the Year. Middleton’s Eady finished second in Player of the Year voting. The 2017 WIAA Division 1 state wrestling championships had just ended. And already, Middleton standout sophomore Kevin Meicher was looking forward, not back. Meicher, who won a state championship as a freshman, couldn’t pull off a repeat Saturday night at the UW Kohl Center. Meicher reached the state finals at 138 pounds, but dropped a 4-0 decision to Sun Prairie’s Drew Scharenbrock. Afterwards, Meicher was already plotting how to turn the loss into a positive. “I think of this as motivation for next year and the year after that and trying to win two more (state titles),” Meicher said. Meicher and Scharenbrock — rivals in the Big Eight Conference — had met twice during the regular season, with Scharenbrock winning both matches. Scharenbrock then took control of the championship match with a first period takedown and never let Meicher get anything going. Brogan Brunker paused once, twice, and a third time. He removed his glasses, tried fighting back tears, then realized it was futile. Back in August, Brunker appeared to be in the best shape of his young life. Brunker, now a junior at Middleton High School, was playing AAU basketball. Brunker was preparing for a football season packed with promise and potential. Then, Brunker was struck with Lemierre's syndrome, a disease that affects just 1-in-1,000,000 people and has a mortality rate between 4 and 12%. Brunker almost fell into that category, suriving a procedure in which his heart had to be re-started and doctor’s gave him a 25% chance to live. “He defeated death,” Middleton football coach Tim Simon said. They are the players they work so hard and give such terrific effort that they eventually pull on their jerseys to get a quick break. Right now, Bavery doesn’t believe his Middleton boys basketball team has enough of those. Bavery was irate following Middleton’s 67-66 overtime loss to Beloit Memorial last Friday. Purple Knights senior Jequan Pegeese drilled three-pointer from the elbow at the buzzer for the win. Middleton, which entered the game with a mathematical chance to tie for the Big Eight Conference title, fell to 16-5 overall and 12-5 in the league. That left the Cardinals two games behind conference co-leaders Sun Prairie and Madison Memorial, who are both 18-3, 14-3. In the past month, they’ve been overlooked, disregarded and largely forgotten about. But Middleton’s girls basketball team delivered a loud and authoritative message last Saturday. Middleton (19-3 overall) shared the league title with Sun Prairie at 16-2. Madison East (16-5, 14-4) settled for third. Jason Compton: I’m a 13-year resident of Middleton, and a producer for Madison Shakespeare Company. MTT: Can you tell us a bit about the founding of Madison Shakespeare Company? Has the experience matched expectations so far? Compton: Madison Shakespeare Company was started in 2011 by John Varda, Warren Hansen, and Steve Cover to present affordable, high-quality theater classics in Dane County. MSC staged Julius Caesar in 2012 and Antony and Cleopatra in 2013, but then went dormant. Our initial performing space, Breese Stevens Field, was an interesting venue and a lot of fun to play, but very expensive. And not very intimate. During this time I appeared in supporting roles in both productions. Tyree Eady looked around Middleton High School Tuesday night and saw what qualifies as glitterati for a high school basketball game. There were college coaches from Marquette and Iowa in the stands. There were a pair of standouts from Marquette, and several players from Big Eight Conference rivals Madison Memorial and Sun Prairie. Eady, Middleton’s sensational senior forward, realized this was the perfect time to make a statement. Oh, the Cardinals are here all right. And they might not be going anywhere for a while. Middleton played arguably its finest game of Kevin Bavery’s 11-year tenure and routed Stevens Point — the two-time WIAA Division 1 defending state champion — 96-66.